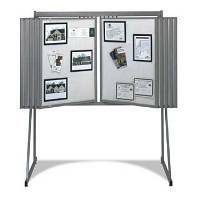 This In Stock Straight Line Floor Display has a light gray steel frame and features 10 two-sided panels, each measuring 30"W x 40"H. Straight Line display offers a 90-degree viewing angle. Part #186766. Model 83-P-10 MMG.